Pinot Noir is the friend of good people with fine educated palates, the friend of lovers of nuances, the friend of those who love to share beauty. This praise song from Baptiste Quinard’s ‘Pinot Noir is an Aristocrat’ is but one of many odes reflecting the passion Pinot aficionados have for what must be one of the world’s most desirable wine cultivars. Indeed, the Pinot Noir star has been on the rise for many a moon, with the wines enjoying ever brighter limelight from critics in the know. Pinot Noir of course is not easy to cultivate successfully, which is why it is sometimes referred to as the ‘heartbreak grape’. For instance, it requires a cool climate to develop good flavour intensity, yet at the same time it is susceptible to frost. Due to the fact that bunches are tightly packed, the fruit is susceptible to rot, making meticulous canopy management essential. The varietal furthermore prefers a clay-type soil as it contributes to the structure of the wine. And so the list of demands goes on, making Pinot a rather temperamental grape to deal with. Luckily there are a growing number of devoted Pinot Noir winemakers who regard the cultivar not only as a challenge but also as a source of inspiration. Enter Creation Wines’ Jean-Claude (JC) Martin whose love affair with Pinot Noir began way back, while establishing his career in Switzerland. 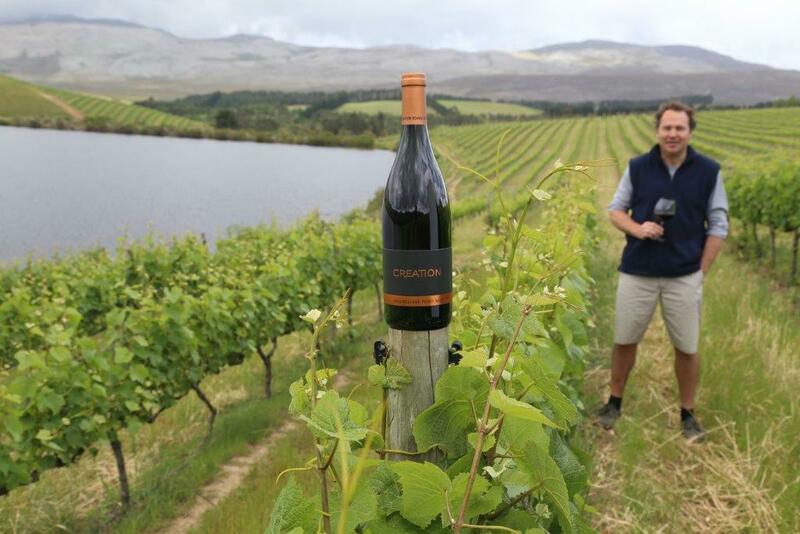 Having qualified as a viticulturist and winemaker, JC honed his skills on Pinot Noir and upon moving to South Africa bridged the gap between Old and New World winemaking to establish his own inimitable style. Before planting his Pinot at Creation he meticulously considered aspect, soil and row direction and selected only virus-free clones (Dijon 115 and 777) for their suitability to the terroir. His Pinot vineyards are planted on a variety of slopes with each site expressing itself in its own stylistic way. Ranging from the Creation (Estate) Pinot Noir to the Reserve Pinot Noir, The Art of Creation Pinot Noir to the Emma’s Pinot Noir, each wine brims with attitude, style and that indefinable intrigue that Pinot aficionados find so alluring. Since the first Creation Pinot release in 2010, many prestigious accolades have testified to the elegance and finesse of the wines. Among the latest are a coveted 5-star rating for the 2016 Art of Pinot Noir in the 2018 Platter’s South African Wine Guide, and a gold medal and 95/100 score at the 2018 Decanter World Wine Awards (DWWA). Leading wine critics such as Tim Atkin, Neal Martin and Greg Sherwood have also repeatedly scored the wine an impressive 93+ points. No doubt, JC Martin loves Pinot Noir. His wife and Creation co-owner Carolyn too waxes romantic when describing the Creation Pinot as “Prince Charming wandering through the forest picking wild strawberries”! Their daughter Emma was only 11 years old when she wowed the world with a limited-release Pinot Noir made under the watchful eye of her daddy. She followed her debut on the world wine stage by releasing the second Pinot under her name last year, at the age of 16. This wine was made from a small parcel of clone 115 Pinot Noir which underwent wild-yeast fermentation – 30% whole bunch. No fining or filtration took place and a mere 800 bottles were released, making each a collector’s piece. It was the famous US wine critic Robert Parker who said: “When it’s great, Pinot Noir produces the most complex, hedonistic and remarkably thrilling red wine in the world …” In celebration of Pinot excellence this coming weekend (25 and 26 January) will see the Pinot producers in the Hemel-en-Aarde flaunting this greatness in the magical open-air setting of Nidderdale farm and surrounds. This year’s Hemel-en-Aarde Pinot Noir Celebration is titled ‘On the Wings of Pinot Noir’ and guaranteed to set your senses soaring. Apart from communal festivities the 12 participating wineries will also host individual events. “At Creation you can look forward to tasting our own award-winning Pinots along with sought-after Pinots from Europe and New Zealand,” says Carolyn. The tasting will be enhanced by delectable canapés, lovingly composed by the gifted Creation Culinary Team. Set against the scenic backdrop of Hemel-en-Aarde Ridge, this unique event promises to be pure poetry!